The 12th annual Clean Sweep, Bates College’s green “garage sale” of appliances, furniture, electronics and other goods donated by the college community, raised $21,223 — a record sum for the event — that will be divided among 14 local nonprofit organizations. 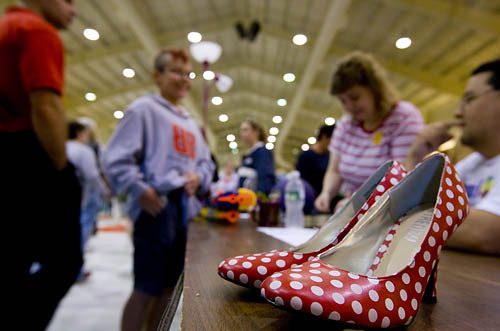 A popular community tradition, the June 16 sale filled the college’s Underhill Arena, drawing hundreds of bargain-hunters from the region. The event is a win-win-win for the nonprofits, shoppers and the environment. Sale proceeds go to nonprofits that, in exchange, supply volunteers to help staff the event, as well as other support. How large a share of proceeds each nonprofit receives is determined by the number of volunteer hours, trucks and tables it provides. This year’s volunteers put in nearly 1,400 hours of effort, says Julie Rosenbach, manager of sustainability initiatives at Bates, a college recognized for both “green” programming and active engagement in the community. Shoppers and the environment benefit because so many valuable items are given a second chance at a useful life, rather than going into the waste stream. “With the help of the participating organizations, we were able to find a home for almost all of the leftovers, so very little — less than would fit in a pickup truck — went into the trash,” says Rosenbach. Located in Lewiston except as indicated, the nonprofits taking part this year were: the Caleb Group (River Valley Village); Common Ties Mental Health Services; Dominican Sisters; First Universalist Church, Auburn; the Justice, Ecology and Democracy Collective, Greene; the Life Center at John F. Murphy Homes, Auburn; Lots to Gardens; Maine People’s Alliance; the Root Cellar; the Share Center, Auburn; Somali Bantu Community Association; Support Solutions; TriCounty Mental Health Services; and the Trinity Jubilee Center. While goods for the sale were donated from across the campus community, many of these still-worthy items came from students preparing to leave campus at the end of the academic year. Bates is one of a number of colleges and universities nationwide that benefit both local nonprofit organizations and the environment by selling useful possessions donated by students as they depart at the end of the academic year.